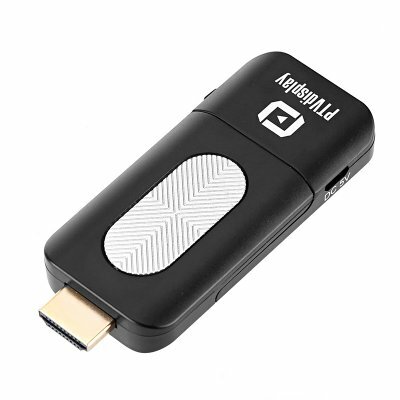 Successfully Added AnyCast Wireless Display Dongle - Miracast, Airplay, 1080p to your Shopping Cart. Take the most out of your smartphone and turn your regular television into a smart TV with the AnyCast Wireless Display Dongle. Supporting both Miracast and Airplay, this remarkable device allows you to mirror anything that happens on your Android and iOS smartphone straight onto your big screen TV. Play games, enjoy movies and even browse the web – from now on you’ll be able to enjoy all your smartphone features on an extra large screen in stunning 1080p Full-HD resolution. Through its WiFi connection, you’ll be able to enjoy lightning fast transmission speeds – allowing you to mirror anything that happens on your smartphone or tablet onto your TV or PC screen without experiencing any delay. Thanks to its plug and play design, all you have to do is plug the dongle into the HDMI port of your display and make sure that its USB port is connected to an adaptor or USB input of your TV in order to receive the needed power. After these simple steps, you’ll be able to enjoy your television as if it is a true Smart TV. Compatible with android 4.2 and above, and iOS 7.0 and higher – you can be assured that this Display Dongle can be used with the vast majority of smartphones and tablets out there. The AnyCast Wireless Display Dongle comes with a 12 months warranty, brought to you by the leader in electronic devices as well as wholesale electronic gadgets..